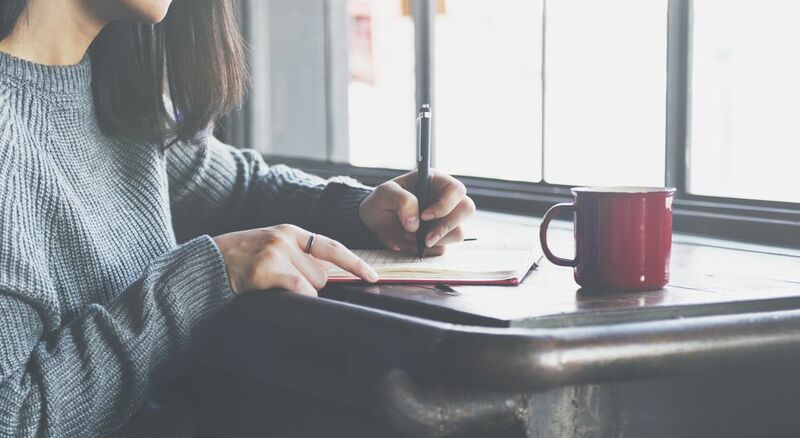 Whether you’re aiming to become more productive or you just want to get to know yourself better, a self journal is a great way to build self-reflection into your daily routine. A self journal is like the journal you had in middle school, but on steroids. It can help you set goals for your life and track your progress and your growth as you move through your day-to-day. It’s also a great way to sit back and reflect on what you love about your life—and how you can change the things you don’t. There are endless ways to start self journaling, but a guided journal is often the best way to kick your new habit into high gear. Whether you’re a super creative person or you skew analytical, there’s a self-journal out there for you. If you’ve already heard of self-journaling, then you’ve probably stumbled upon this company. The BestSelf Co. SELF Journal is one of the most popular and robust self-journals you can buy, and it’s not hard to see why it has so many fans. Taken at face value, it’s a daily planner that helps you increase productivity in your personal and professional life. But it’s also so much more than that. The journal is divided into three sections: daily, weekly and monthly. Each day you can chronical your to-dos, your goals, your lessons learned and even your evening gratitude, giving you a chance to look introspectively at your life as you reach your long-term and short-term goals. Each journal is a 13-week process, allowing you to track achievable goals and see real results (it’snot dated, so you can start anytime). Each planner is 8.25” x 5.5”, making it incredibly easy to travel with and keep with you every day. Owners love the SELF Journal, noting that it increases productivity and doesn’t feel overwhelming the way a yearly planner sometimes can. They love that it allows you to create and track macro goals instead of just overall long-term goals, and many remark that the construction is beautiful and looks high-end. So many of us track our day-to-days digitally, but the internet isn’t the best place to find and record inspiration. That’s where the Studio Oh! Self-Discovery Guided Journal comes in. Though it won’t help you remember that doctor’s appointment next Tuesday, it is the perfect canvas for coming up with ideas and tracking memories. This 5” x 8” journal has 144 pages of guided self-discovery. Each page includes a colorful prompt such as “five people I’m grateful for today” to help you look deep within yourself and learn more than you ever thought possible. It’s beautifully designed, each page featuring a striking illustration, some with quotes to inspire you. Though adults also enjoy the Studio Oh! Journal, it’s a great gift for teens (some reviewers note that it’s fun but slightly juvenile). If you are looking for a great gift to inspire a loved one, this is a great choice. Check out our guide to the best gifts for teens you can buy today. Many people find bullet journaling as de-stressing as adult coloring. It allows you to use your creativity to ruminate on your day, your goals, your to-dos or anything else on your mind. The Lemome Bullet Journal is a great place to start, giving you the blank canvas you need to get organized. This journal has 192 pages of 120 gsm weight paper (which is about 30% thicker than a standard sheet of paper), and measures 8.5" by 5.7". It has a thread-bound design that allows it to lay flat, making it easier for you to journal to your heart’s content. Your purchase comes with a 100% money-back guarantee—so if for any reason it doesn’t work out, you’re protected. Reviewers say it’s one of the most durable, well-made journals they’ve come across, remarking that it’s an incredibly good value for the low price. The Mastery Journal is a 100-day productivity and discipline journal created to measure and increase your daily productivity. Each day is divided into four focus sessions in which you’ll time yourself at a task and measure your overall productivity. After the focus sessions are completed, you’ll review and grade yourself so that you can work to better use your time each day. At the end of each ten-day cycle, you’ll reflect on your overall productivity growth and brainstorm how to improve next time. If you’re struggling with a lack of focus or motivation, this journal is a great tool in helping you achieve your goals. Everyone has a creative side, but some of us could use a little jumpstart to help channel it more often. Enter the Creative Sprint Journal. This interactive workbook is made up of six 30-day sprints to encourage you to get your creative juices flowing, whether that means drawing, taking photos or painting. You’re given a theme such as “Embrace Limitations,” along with daily prompts to inspire you. At the end of your 30-day sprint, you’ll have an opportunity to reflect and grow from what you learned about yourself. Because it’s not a daily journal, you can use it either chronologically or whenever you find you have a burst of energy. Research proves that being grateful is good for your mental health. As the name implies, the Good Days Start With Gratitude journal is, well, a simple notebook designed to help you take stock of what you’re thankful for each day. It has a full year of gratitude, broken down into weekly segments that allow you to remember what you’re grateful for each day and check in at the end of the week. By writing down what makes you happy and reflecting on your growth, you can work towards becoming a more grateful, grounded person. Each segment is beautifully designed with a quote to inspire you as you start the week off. This gratitude journal is a budget-friendly option for anyone who wants to remember to give thanks each day. Reviewers say it’s a beautiful, simple journal that they look forward to using, though some do note that it can become repetitive (as each week is the same). Sometimes you simply just need a clean, blank canvas to start journaling, and the Moleskine Classic Notebook is one of the best you can buy. This 5” x 8.25” notebook has 192 pages of blank, 70 gsm weighted paper. It’s unlined, making it flexible for whatever type of self-journaling you want to do—and as typical with Moleskine, it has a signature pocket at the end, so you can keep anything that inspires you. It also has the standard elastic closure and hardbound black cover, making it easy to use when you’re on the go. Moleskine is perennially one of the best-reviewed products out there, so you can't go wrong introducing it into your self-journaling process.